Penguin and the National Literacy Trust have teamed up to launch a free teaching resource inspired by Michelle Obama’s bestselling memoir, Becoming, to boost secondary students’ literacy skills, leadership abilities and confidence: literacytrust.org.uk/becoming. Literacy levels and confidence amongst England’s young people is worryingly low. Last year, a third (36%) of 16-year-olds failed to get a good grade in English language GCSE and more than a quarter (28%) of young people reported feeling like they are going to fail in life. Building on Becoming’s central themes of empowerment through education and the important role of self-belief in achieving your potential, the new teaching resource features a range of activities designed to give students in Key Stages 3-5 new opportunities to use and develop their reading, writing, speaking and listening skills. The resource also includes a wealth of motivational materials for students, including excerpts from Becoming, a video link to Michelle Obama’s Penguin Talks event with students at Elizabeth Garrett Anderson School in London, and a clip of her final speech as First Lady of the United States. 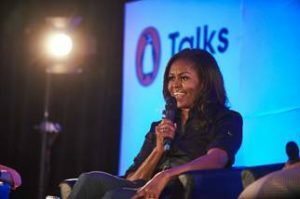 The publication of the resource kick starts a week of activity to celebrate Becoming, which includes the BGF x Becoming Festival from Black Girl Fest and Penguin from 9-11 April, and culminates with Michelle Obama’s appearance at The O2 this Sunday as part of her sold-out Becoming book tour. The publication of the resource follows the launch of the National Literacy Trust’s Words for Work: Women in Leadership programme in partnership with Lancôme, which supports girls and young women to develop the literacy skills, leadership abilities and confidence they need to achieve their potential. The programme also aims to broaden young women’s career aspirations by giving them the opportunity to both hear from and question women in work about their journeys to success, the challenges they faced and how they overcame them.